During this journey, one will experience breathtaking views of Mount Everest, Kanchenjunga and other Himalayan Peaks including sacred Chomolhari and Mount Jichu Drake in Bhutan. On arrival at Paro International Airport you will be meet by our representative. After lunch drive to north of Paro to visit Drugyal Dzong which is a ruin fortress built to commemorate Bhutanese victory against Tibetan invasion. Overnight at Paro Zhiwaling Hotel. couple taking photos around Paro. Overnight at Paro Zhiwaling Hotel. After breakfast, drive to Punakha valley which is situated at a lower altitude compared to Thimphu, therefore it is slightly warmer. The journey will take about 3-4 hours via Dochula pass (3050m height, highest point between Thimphi-Punakha). On arrival, Lunch will be served. After lunch there will be a small hike (20mins) to Chimmi Lhakhang which is a 14th century Buddhist temple. After the hike, visit Punakha Dzong which is the most beautiful fortress in Bhutan. Overnight at Punakha Dhensa Boutique Resorts. After breakfast, drive to Thimphu which would take about 3 hours. 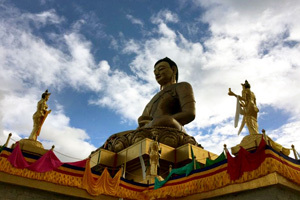 Visit Memorial Chorten which is a Buddhist stupa built in memory of the third king of Bhutan (Jigme Dorji Wanchuck),Tashicho Dzong which is the main fortress of Thimphu district and King’s Office. Visit Takin zoo which is a preservation center for an endangered species called Takin. Overnight in Thimphu Termalinca Spa & Resort. After breakfast, visit Buddha Point where there is a 52 feet Buddha statue overlooking beautiful Thimphu valley, visit Folk Heritage Museum—its gives you a glimpse of the traditional Bhutanese lifestyle, in addition to artefacts from rural households; it also displays an impressive collection of typical household objects, tools and equipment and visit General Post Office. Afternoon driver to Paro. Overnight at Paro Zhiwaling Hotel. 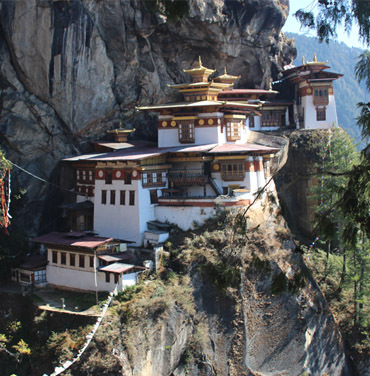 After breakfast, 30 mins drive to north of Paro valley for hiking to Taktsang, (Tiger's Nest) the most important monastery in the country and also the main highlight today where pilgrims are attracted by this monastery and do visit in this days. The hike takes about 5-6hours for round trip and visit the temple. Later hike back downhill for lunch in cafeteria. Evening at leisure. Overnight at Paro Zhiwaling Hotel. After breakfast, transfer to airport for departure from Paro. Luxury hotel in sharing twin basis. All entrance fee with English speaking guide. Wedding ceremony arrangement at temple with small monk procession , prayer ceremony by 7-10 monks, blessing by head monk, arrangement of costumes for both the bride & groom.